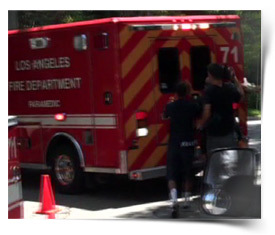 An EMT who arrived at Michael Jackson's house 4 minutes after the 911 call says Michael was dead when he arrived, and it looked like he had been dead for a long time before Dr. Conrad Murray called 911. Richard Senneff testified when he arrived at MJ's house and saw MJ, he looked like a hospice patient -- extremely frail. Senneff says he believes Murray must have waited at least 20 minutes before calling 911, based on the condition of the body. MJ's EKG was flatlined. And Senneff said, when he asked Murray if MJ had been taking meds, all Murray volunteered was lorazepam (Ativan). Murray never uttered a peep about Propofol. Murray told Senneff Jackson had been "dehydrated."